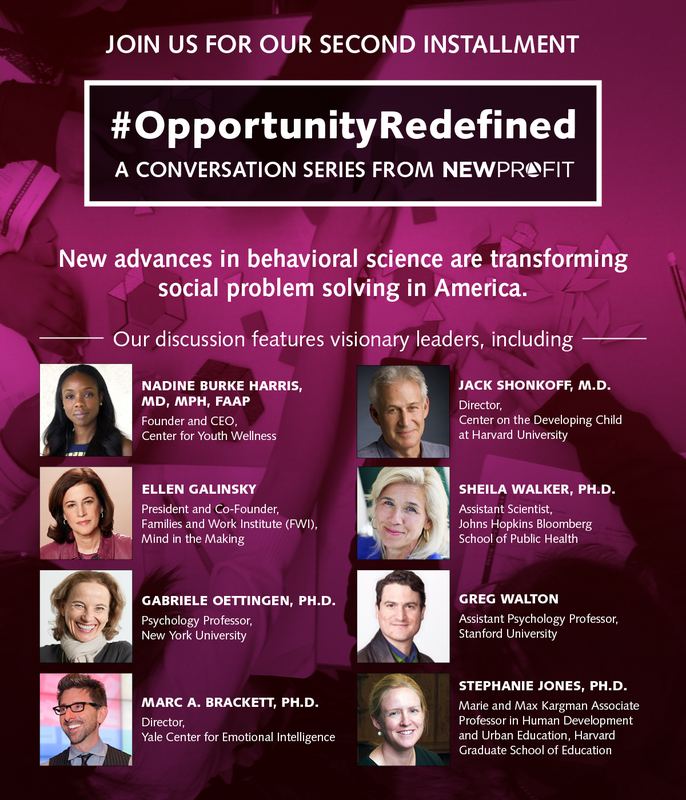 We’re back with the second installment of #OpportunityRedefined, a new social entrepreneur-driven digital dialogue series about the future of problem solving in America. We’re exploring rising trends that are shaking up social innovation and giving us hope that some of America’s biggest challenges can be addressed. The first installment explored an evolving understanding of social mobility in America, with a particular focus on how people and organizations are thinking and acting differently about diversity and inclusion in the wake of recent events in America, including the tragic shootings at Charleston’s Emanuel AME Church. We had some truly amazing participants join the discussion, which you can track back using our “Top 6 Takeaways” blog post. Be sure not to miss the Google Hangout video we posted from our conversation with three extraordinary women social entrepreneurs! Our second installment will focus on how advances in a variety of behavioral science disciplines – neurobiology, psychology, behavioral economics, and others – are starting to drive a new wave of innovation, with huge implications for program models of organizations working across all facets of human development. It feels like we’re at the dawn of a transformative era, yet there are still more questions than answers at this point, and we’ll be digging into many issues with our participants. One the one hand, deeper understanding of things like how the child’s brain develops are opening up tantalizing, and sometimes counter-intuitive, possibilities for transforming education, particularly for low-income or marginalized children. On the other, many open questions remain about how to effectively and responsibly translate scientific and technological advances into a classroom setting, particularly at scale. This is a challenge we’ve been looking at closely through New Profit’s Focus Funds—collaboratives of social entrepreneurs, philanthropists, researchers, and other cross-sector partners that aim to find new ways to unlock systemic change in education, early childhood development, and economic empowerment. Our goal is to lift up these amazing leaders and ideas, provoke conversation about the opportunities and challenges, and drive action and collaboration. We’ll be posting regular content on this blog and across Twitter, Facebook, and LinkedIn with the hashtag #OpportunityRedefined. We’ll also be holding a Google On Air Hangout conversation with some of our participants at the end of October (check out our first Google Hangout here). If you’re interested in receiving details about the event, sign up for the newsletter at the bottom right of this webpage. We would love for you to join us in this discussion and to hear your thoughts and feedback on the series. Please let us hear your voice!